I have a minor obsession with making temporary tattoos. 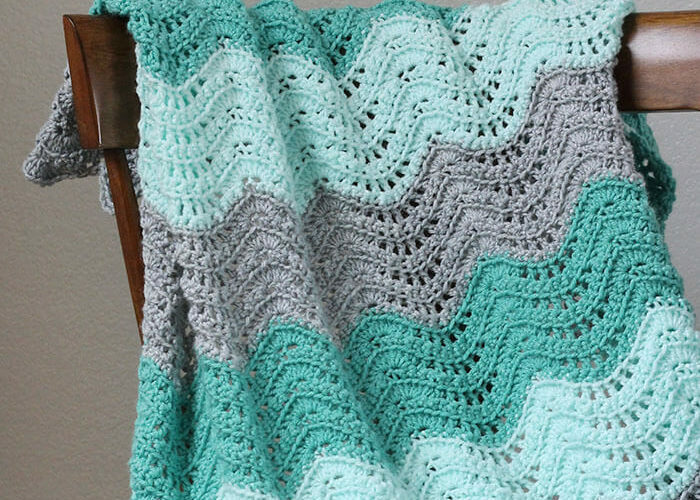 I think they are just so much fun – especially for parties and holidays. I really loved the watercolor Fourth of July tattoos I shared with you all last month, and I’ve been meaning to share some other designs I’ve come up with. Today is the day! Back in April, I attending a creative blogging conference. I wanted to make a little something special to hand out with my business cards, and I decided little tattoos would be the perfect thing! I made little labels with tattoo instructions that I printed and cut out using my Silhouette and then I just secured the bottom of the tattoo with a small piece of black washi tape. I was pretty much crazy about my cards and those tattoos. And while I loved sharing the tattoos at my conference, I wanted to share them with you all too! 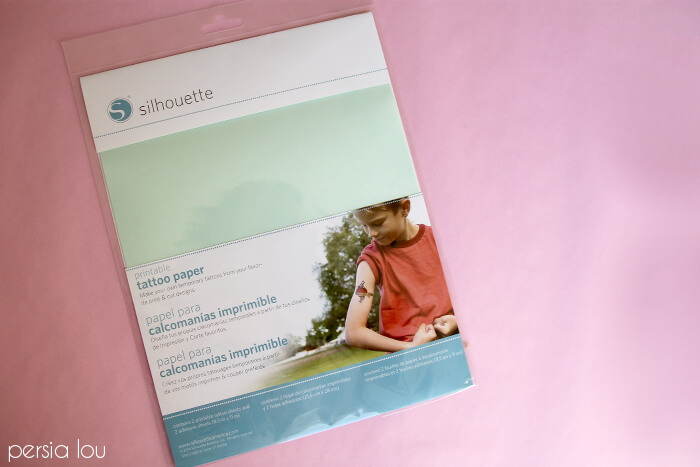 The temporary tattoo paper comes with a lightweight cardstock with a glossy finish on one side and an adhesive sheet with a light green backing. 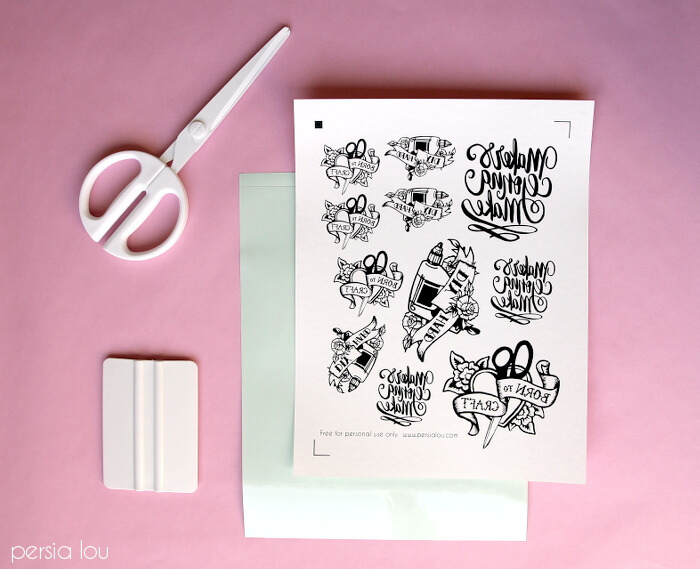 Start by printing the maker tattoos image onto the glossy side of the white paper. Your images need to be reversed for the tattoos to work correctly. If you are using my image, they are already reversed for you. Apply the adhesive sheet to the printed image by peeling off the top strip of the green backing. Next, apply the revealed line of adhesive to the top of the printed sheet. Peel the green sheet back while smoothing the adhesive onto the printed sheet. Make sure the adhesive is firmly applied by going over it with a scraper or credit card. 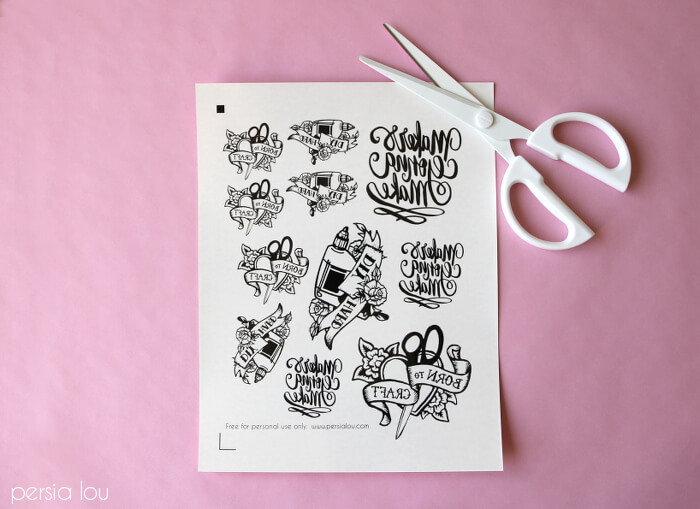 Next, cut out the tattoos using Silhouette’s print and cut feature or just a pair of scissors. When you are ready to apply the tattoos, just peel of the clear plastic top sheet, place the tattoo on the skin, apply a wet washcloth or sponge for 10-30 seconds, and then peel off the paper. Et voila! Sweet new maker tatts. What do you think? Would you rock one of these? Which is your favorite? What a fun idea! Love how they turned out. Ms. Lou, I love crafting. its like therapy for me when I am down and out. 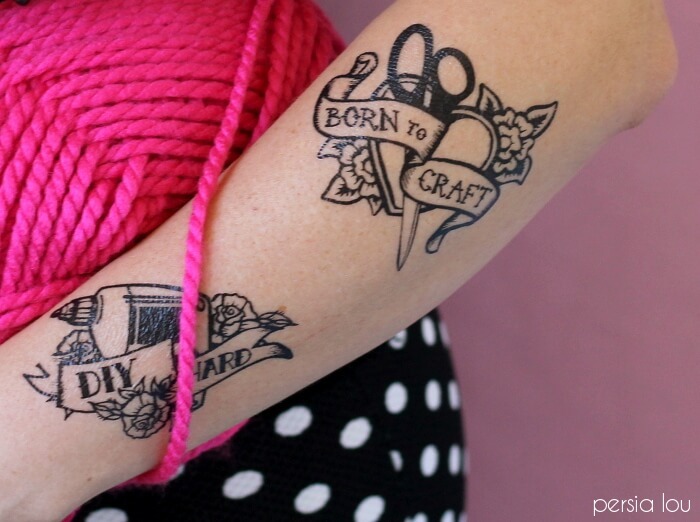 I saw your tattoo – born to craft. and I am hoping you will allow me to use as my logo. my email: [email protected]. I hope to have the papers down and done by legalzoom.com. but I haven’t found a image that I liked until I came across yours. I just want to trademark my business name and then work on a business plan, and learn more about how to launch it. 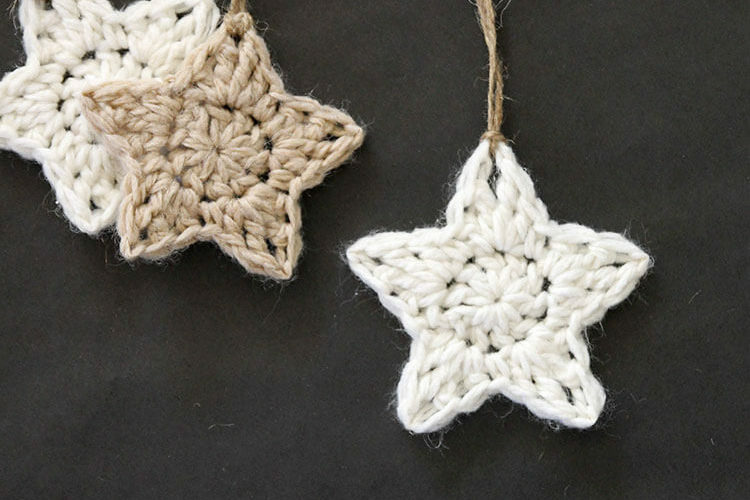 I’m a crafter and sewer so I love these. I can’t get a regular tattoo due to leukemia so these are great! Thanks for sharing! I also signed up for your updates and all. As you say, I can’t decide which one I love most, I want to wear them all at once! Does this work for all printer types? I’ve got a pretty old laserjet. Yes! I think so. I’ve used both an inkjet and a laser and it’s worked fine with both. 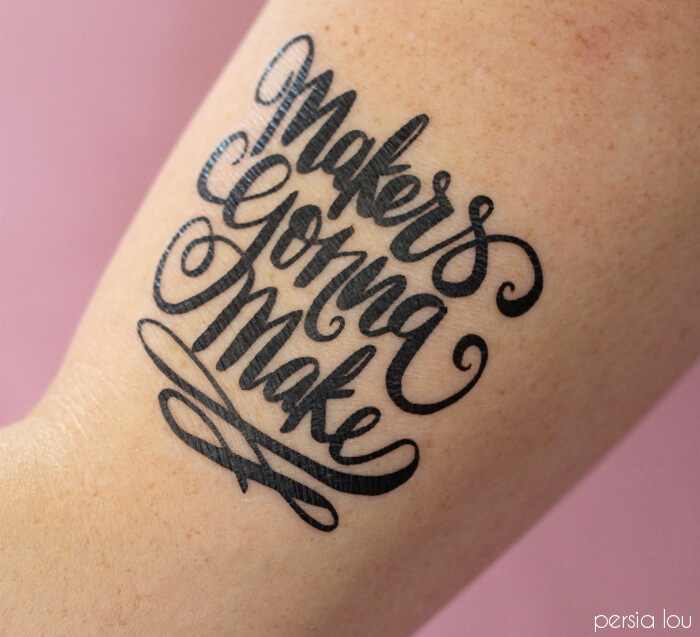 Makers gonna make! LOVE! I just bought some Rifle Paper temp tattoos and want to try them this weekend. I’m actually considering a real tattoo so I thought I better try the temp tattoos first. Thanks, Ursula! Oh and I love Rifle Paper! I’m sure they are gorgeous. I love that you are wearing THREE for the picture. What we won’t do! Also, I adore these! Pinning. 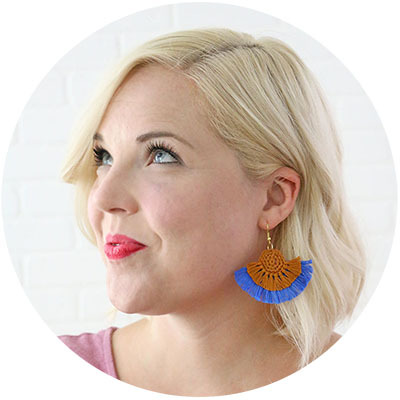 I just paid money to get custom tattoos made for a wedding I was a bridesmaid in…. long story short, the bridesmaids were all going to wear them and THEY ARRIVED LATE! So we didn’t get to wear them and the entire time I was kicking myself for not making them myself. Holy craft! I don’t know which one I would pick. I might have to go with all three and distribute them in different locations on my body so they could each have a place to shine. They’re awesome! These look fabulous! My favorite is DIY Hard! I’ve been trying to find the best decal paper to use for my temporary tattoos. Silhouette brand was my first attempt and i found some other versions that sold stock in bulk but I can’t seem to get anything to not just look like the way yours came out. Mine look super shiny, and wrinkle the skin its on pretty much immediately, so they just look weird. I’m just so impressed by your success; I feel inspired to try again! Maybe try baby powder like Rene suggested? I have also seen a product called Liquiskin Shine Remover that I have wanted to try, although I haven’t tried it yet, so I don’t know how well it works. I love these! I’ve had tattoo paper for a while and never used them. I’ve always wanted a tattoo on my foot but not the pain! Lol I think I’ll make one for my foot for flip flop days. i was wondering how well the tattoo paper worked , thanks for the tutorial. Pro tip, apply some baby powder to the tattoo after it is dry to make it look more real. I had a serious temporary tattoo obsession in high school and this technique made it look less shiny. Several people thought they were real. Thanks for the tip! I will have to try that! Oh I love them so! Is there anyway I can purchase the font from you. I love it! These are just too awesome! They would really make me feel like a crafting badass. 😉 Thanks for the great tutorial on how to use the tattoo paper as well! I love this idea & your desigms ! Are they safe? I read printer ink can be toxic? LOVE these…but I don’t have V.3 and I’m not sure I want to update…is there any way you can save these in Legacy so I can rock them?? Thanks so much – you’re WAY creative!! Hi Susan! Let me get on that. I didn’t even think about that being a problem. Thanks! Haha – that’s my fave too. 😉 Thanks for stopping by, Vanessa! AMAZEBALLS! I am loving these hard. 🙂 Nicely done!! These are wicked. I love the born to craft. I have to have one. My husband will not let me have a tattoo. Oh WOW! 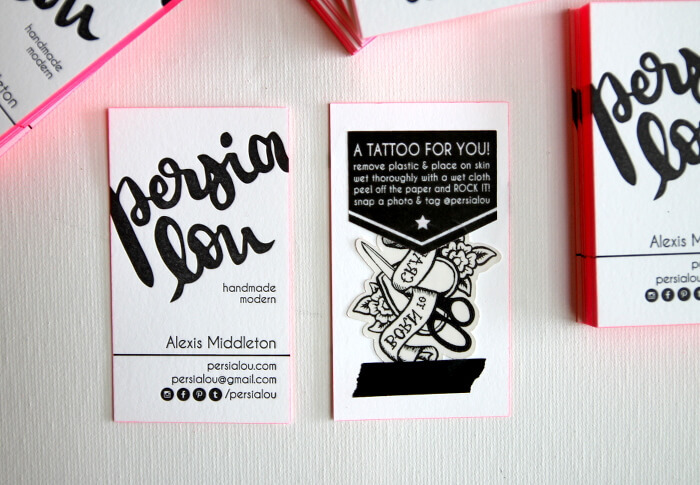 Such a great idea, I never thought to put a tattoo of my designs with my business card. Thanks for sharing Alexis! Is it possible to Gold Foil the tattoo paper with a laminator and laser printer? I don’t think so. I haven’t actually tried it. But I don’t think it will work because the image is reversed, and when you put it on your skin, the underside of the ink will be facing out, so I think the foil would be facing your skin at that point. I hope that makes sense. If you find a way to do it, I would love to hear about it! Never knew that there is tattoo paper. Well, now we are going to have some fun. It is SO much fun! Enjoy! These are fantastic! 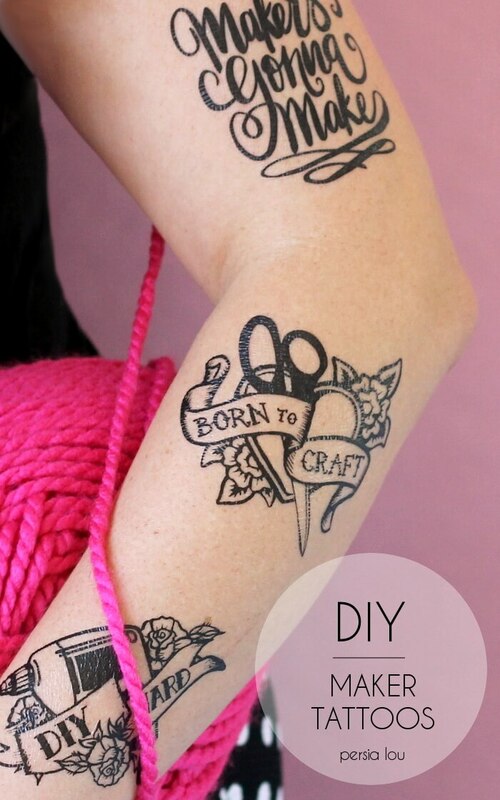 I love the Born to Craft one! Is it possible to use it as an actual tattoo? I’ve been wanting to get a craft themed one for the longest time! and i would LOOOOVE to get that one. Do you sell tattoo designs? OH MY GOOOOD I LOVE YOUR TATTOOS. AND THANK YOU FOR SHARING. I just bought that tattoo paper to make my kids some tattoots, and also to make some for my son to give out to his friends in school, but those will be with a cause, and that is the shooting at Stoneman Douglas High School, in Parkland, FL. over a week ago, that was right outside my house. very sad, and has had such an impact in my community, so i thought i would make some MSDSTRONG tattoos for my son to give out to his friends that had siblings that were affected by this horrible tragedy. I hope I can make these tattoos. Hi Yeli, Thanks so much for your comment. I have been heartbroken by the tragedy in your town. I live in Las Vegas, not too far from the shooting we had here a few months ago, and I know what an impact something like that can have on your community. I love the idea of making tattoos for your son and his friends! Sending so much love to you all! 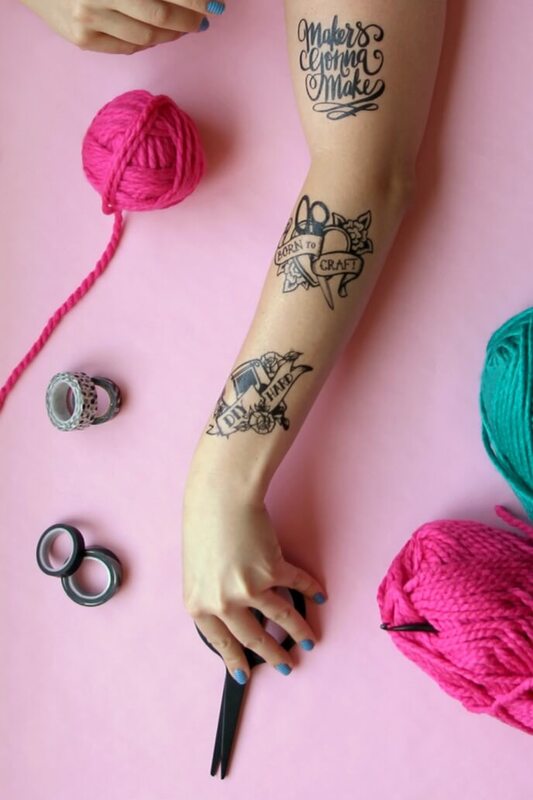 I’m love your blogs, your page, your crafts.. everything… but hoe do i get the file for the tattoos? i’m a subscriber but there’s no signing in is it? thanks. Hello! The file for the tattoos is included in the supply list in the post. Just click on the link for the PDF file or Studio (if you are cutting with a Silhouette). Hope that helps!